I was inspired to write this post by a slew of recent studies showing that midlife fitness (midlife roughly defined as 40-65) makes a big difference to health outcomes and cognitive function for the rest of your life. I’ve certainly experienced this personally – increasing my fitness at 40 helped normalize my blood pressure levels. And I’m probably fitter today than I was in my 20s (talk about wasted youth!). 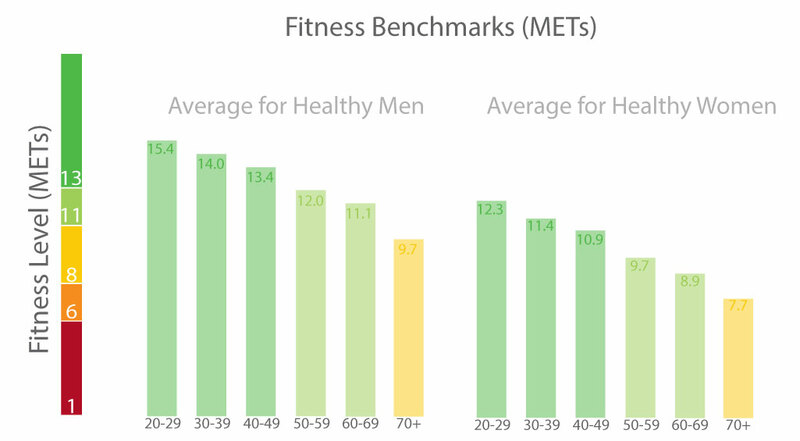 The interesting thing about these studies is that you don’t have to be a super-athlete at 50 to stay healthy – the level of fitness expected – 12-13 METs is well within the reach of the average 50-year old male as you’ll see from the charts below. (Many of these studies have been conducted amongst male cohorts so difficult to be as precise for women — I’m hoping to see more studies on female fitness & health impact in the future). The other interesting question that it raises – if you can stay as fit as the average 30-year old (which is an achievable goal for most 50-year olds) can you entirely avoid aging related health issues ?